For a historical view of Master Marcus, view Master Marcus on SWRPedia. 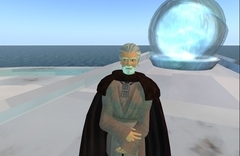 Marcus Moreau was one of the original Jedi in Second Life. He helped found several orders of Jedi, most notably the Jedi Alliance on New Holstice. Master Marcus was also the creator of the Great Library, first on Anoth and then moved to its original ancient home of Ossus. This is a one-stop place for almost all SL SW materials. Some places have their own libraries, but the Great Library of Ossus hosts anything common to the entire community. It was Master Marcus' mission in life to create, maintain, and improve upon this library. Master Marcus was thought to have passed away ((in June of 2008)) at over 200 years of age, having served as a model Jedi for many years. His legacy was not just the Library or his friends' memories, but also the Tome of the Old Jedi. This was his lasting testiment to the times of old and the foundation of all SL Jedi. Further, the ruins of New Holstice still prevail today. Recent information indicates that Master Marcus has returned from the Netherworld after 20 years of being thought dead. The Old Jedi Order on Talus found him on Rhen Var unconscious, his supposed death and recent history a mystery to all. He has since joined the OJO as a Master, and hopes to continue his work as a true Jedi. Marcus Moreau still thrives today as a former sim owner and an avid Star Wars fan. MM has been in SL since Christmas of 2004 and was an active Jedi almost that entire time. His character had moved on, but has since returned. Feel free to ask MM about his past or anything he has done. Be sure to visit New Holstice and the Great Library, both legacies to his work.